Mine had a National Cycle windscreen on it when I bought it and I like it. I will probably change that to a flyscreen during the summer though. So far I am actually only using the front one of these... helps keep my thumper cleaner. If you don't have one of these, get one soon. You will use it. I'm not going into accessory riding gear such as neck gators, leather legs, cooling vests, and Camelbaks since that'll probably be a separate thread. The Savage is a most versatile little bike. It morphs to whatever you need. I needed a lightweight city bike, to commute to work and to go shopping. For that I needed luggage capacity. 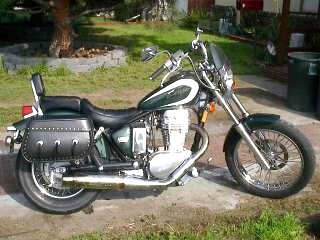 Choices include a luggage rack mounted trunk, leather saddlebags, or hard saddlebags. I went with LeatherLyke hard saddlebags. A bit expensive (over $400) but not if they are what you want. I have a BLog entry detailing the mounting of my saddlebags. The saddlebags carry my Hat -- without which I cannot appear in public. For shopping a saddlebag can take a gallon of milk, or a ten pound bag of potatos, or a five-liter box of wine, or a 20 ounce bag of tortilla strips and a pint of salsa. I just got and fitted my last two stainless banjo bolts yesterday, so now I have stainless steel braided brake lines front and back with stainless banjos and bolts, recommended. 1- The fork brace. Improves the steering very much. 2- I've got a bicycle computer on the steer to read the speed and to use it as a tripmaster. It works great. 1- The saddlebags. I like a rugsack better. 2- Handlebars. They loose their rubbers. -WITH WASHERS ON SCREWS, INSERT FROM INSIDE BAG...THROUGH DRILLED HOLES...THROUGH HOLES ON SISSY BAR...AND INTO BACK OF PAD. - BEFORE ATTACHING WITH SCREWS, CUT THE BOTTOM END OF THE BELT LOOP FREE AND LOOP IT OVER THE TOP OF THE SISSY BAR RAIL - MAKE 2 HOLES IN FLAP & BAG AND LACE ON BEFORE PERFORMING ABOVE PROCESS. I Bought this forkbrace in 1989 from Sebring. I asked a salesman on the motorrai if Sebring could deliver me this forkbrace. Send me the measurements, he sad. So I did send him the measurements end he send me this frokbrace. I got my fork brace at SuperBrace. It's a tad pricey but it's very high quality and works wonderfully. I believe it was suggested by TheHogHunter in an earlier thread. I took a chance on it and I am very pleased with it. P.S. Even though the web page says it fits 86-87, I figured that there had been no changes in the forks that I could find and it fits my 98 just fine. I'm playing catch up. Have just been too busy to keep up with all of you for the past month or so. Here is my accessories so far. I will come back later and add a link to pictures. Maier windshield. Inexpensive and does the job except for a bit of hemet buffeting at highway speeds. Four hands were necessary for installation. It looks good from the front but not from the riders seat. I may buy someting different one day but I'm not in a hurry to do so. TourMaster Nylon Saddlebags (medium) and matching fork bag. I love them! Good quality nylon and leather trim. The zip off feature will be great for overnight trips and velcro closure means no messing with buckles. Small enough for the savage but big enough to hold my half hemet. Gas $3.39 a gallon, map $5.95, getting lost on a scenic country road.......... priceless! Hey, on those Superbrace fork stabilizers, they only list 2001-2003. I have a 97. Any problems that anyone can forsee? None. Brace fits '86 thr 2004.